Why Is TransMilenio Still So Special? TransMilenio started operations in December 2000, and after more than 8 years it is still regarded as the gold standard for Bus Rapid Transit. Cities as diverse as New York, Delhi, Jakarta, Johannesburg, Beijing and Mexico, to name a few, have all drawn inspiration from Bogotá. But still there is no BRT system that matches its performance – at least not yet. Why is TransMilenio so special? The clues could be in its “rail like” capacity and travel speed – not seen before in bus systems, and its ability to transform traditional bus operations with an interesting public-private partnership model. The most interesting aspect is that it has shown that it was possible to innovate, transform, and improve transport conditions in a very large city with profound transport challenges. It proved that cities can think outside the box, and bring solutions to the people without costing a fortune or taking decades to build. Kudos to Mayor Enrique Peñalosa, who started it from scratch, and the following administrations, which have continued and expanded it. After 8 years, 76% of users rate the system as being good or very good. While TransMilenio is still far from solving all the mobility problems in Bogota, it has been a turning point that reversed a downward trend of traffic congestion and urban chaos. 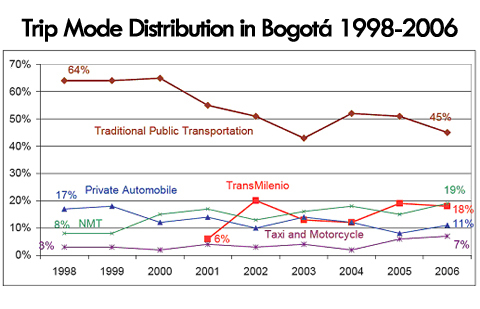 TransMilenio’s implementation, along with Bogota’s other sustainable transport initiatives, has resulted in a reduction of private automobile use and increase in non motorized transport in the city, while keeping the transit use stable with a 60%+ share (traditional public transport plus TransMilenio). These trends are quite different than similar ones in other developing cities where auto use increases and transit use declines. For those interested in facts and figures, you can find this information after the jump. The system’s infrastructure includes 84 km exclusive busways on central lanes of major arterial roads, roads for feeder buses, 7 terminals, 7 intermediate integration points, and 100 enclosed stations with pre-payment and level boarding to the buses. Trunk lines are served by 1,071 articulated buses, while integrated feeder lines are served by 412 conventional buses (www.transmilenio.gov.co). To maximize capacity, trunk lines accommodate express services stopping at selected stations only, as well as local services stopping at all stations. The high end features of the system and the combination of local and express buses allow the system to carry up to 45,000 passengers per hour per direction at a commercial speed of 29 km/hour. Bus and Fare Collection services are operated by private operators, including traditional transport providers, procured under competitively tendered concession contracts. Overall system planning, management and oversight is performed by a new public agency (TRANSMILENIO S.A.). Service in the initial 14 km commenced in December 2000, after less than three years of project planning. Gradual expansion continued over the following 7 years. Currently the system is providing fast, reliable transit to 1,4 million passengers/weekday with a flat fare of COP 1,500 (USD 0,75) per trip. Travel times have been reduced by 32% for system users and traffic fatalities by 88%. Green House Gas reductions have been estimated in 134,011 Tons/year (in 2007, see J. Grütter, CAF, TRANSMILENIO https://cdm.unfccc.int). TransMilenio has had a positive impact on air quality in the vicinity of the BRT corridors. For example, before and after measurements in Av. Caracas show 43% reduction in Sulphur Dioxide, an 18% reduction in Nitrogen Dioxide, and a 12% in particulate matter.